1) Any RTR that is purchased as it comes out the box with motor and speed control. Please note: only new drivers to the sport with no driving experience is allowed in this class. If such a driver wins four race days in a row, he has qualified to move on to the next class. 3) Motors can be silver can, fan or black fan or any other motors fitted to a ready to run. 4) Weight of the car with a battery fitted must be no less than 1.38 kg. 5) Any body, scale or semi scale, suitable for 1/10 scale Electric racing, excluding World Sports Prototypes and Can Am cars. 7) Speed Control that is supplied with the RTR kit. Please note : The above rules applies to Meyerton Raceway, only. 3) Motors must be silver can Johnson 540 two slot or silver can fan motor with two slots. 4) Weight of the car with a battery fitted must no less than 1.38 kg. 7) Speed Control that will be compatible with the 540 Johnson or the silver can fan motor any make. 8) Gear ratio can be geared to suit the 540 Johnson and silver can fan motor. 3) Motors must be 21.5T to SARDA spec but can be any make as long as it has fixed timing. 4) Weight of the car with a battery fitted must not be less than 1.38 kg. 5) Any bodies, scale or semi scale, suitable for 1/10 scale Electric racing, excluding World Sports Prototypes and Can Am cars. Two door bodies and four door bodies are allowed (Meyerton rule for club races only). 7) Speed Control to SARDA specs and any make as long as it is not boosted and timing advanced. 8) Gear ratio will be limited to maximum roll out of 54mm. Only TT01, TT01E, TT01E R, TT01 R, TT02 and TT02 R chassis’ are permitted in this class. Only spare parts and Hop-Up option parts for these chassis types currently available in South Africa are allowed, and must be used as originally intended. The motor is limited to a standard, 2-slot, Johnson 540 motor. Any attempt to modify or to influence the ability of the motor is NOT allowed. (eg. No com-drops, No cutting of brushes, Original screws must be used. etc), however the wires of the speed controller can be soldered directly onto the motor. Only standard stick type (round case, not square or rectangular) Ni-Cd, Ni-Mh 7.2v batteries or Li-Po 7.4v batteries UP TO 4000mah, MAX discharge of 40C are allowed. Battery wires can be modified at the bottom of the connector to accept other types of speed controller connectors. Wire length must exceed 3cm. Please note that modification of the battery compartment is NOT allowed. Car does not have to be equipped with cockpit detail and a driver figure. Minimum weight of the car ready to run is to be 1,400g, without a transponder. Clearance under main chassis to exceed 5mm after the race. The highest speed gear ratios that one may use for the TT01 and TT02 respectively are as follows. 3) Motors must be 13.5T and can be any make of motor. Only M03, M04, M05, M05 Ver. II M06 and M07 series chassis’ are permitted in this class (Including Pro chassis’). Only Ni-Cd, Ni-Mh 7.2v batteries or Li-Po 7.4v batteries are allowed (there is no restriction on capacity or C rating). Battery wires can be modified at the bottom of the connector to accept other types of speed controller connectors. Wire length must exceed 3cm. Please note that modification of the battery compartment is NOT allowed. Motor brushes, if applicable, must be from Tamiya. Any attempt to moify or to influence the ability of the motor is NOT allowed. (eg. No com-drops, No cutting of brushes, Original screws must be used. etc), however the wires of the speed controller can be soldered directly onto the motor. Car does not have to retain the original wheel drive concept. Drivers can choose either FWD or RWD configurations regardless of car body. 4wd or twin motor configuration will not be allowed. Speed Tuned Gear – 16, 18 and 20T pinions are allowed for the M03, M05 and M06 chassis. Up to 19T pinion is allowed for the M04 chassis, but in the case of a 26D tyre being used the pinion size is limited to a 17T. Minimum weight of the car ready to run is to be 1,150g, without a transponder. Clearance under main chassis to exceed 3mm after the race. One may only use a wing if the body you are using comes with one. Please note that you may not interchange bodies and wings, they must both be used as originally intended. 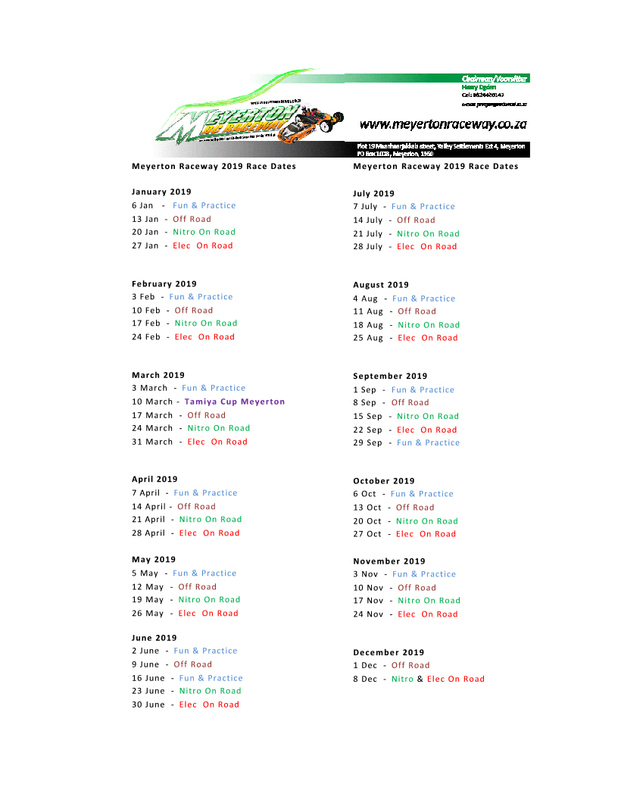 Please note : all other classes will be 100% to SARDA or Tamiya specs for 2016 rules and will stand for the period of 2016 at Meyerton Raceway. Please note : Any driver that has failed to register on- line and arrive late (i.e. after the drivers’ briefing) will lose his ranking position and will be added at the bottom of the next heat. 2) No pause will be applied after the computer’s set time has timed out. 3) On a fun day the track will be open from 9h00 and will be open for everyone, regardless of their driving skills. The track will not be sugared and no timing equipment will be set up. 4) ON ROAD RACE DAY; Times will be as in clause number one. The track will be swept and sugared on Saturday afternoon late or early on Sunday morning. The timing system will be connected on Sunday morning. 5) Keep in mind that the track is surrounded by gravel roads and a moderate amount of dust on the tar track is likely to be present in windy conditions. 6) We will use the BBK system and run two qualifiers of five minutes each, one to count, and two five minute legs in the Mains, which will be added at the end of the race. 7) Please make sure to enter your car in the correct category according to your motor size to prevent disqualification. 8) Please note: The track will only be sugared for club races and other big events. Times will be as in clause number one. The track will be prepared to off road standards and will be swept on Fridays. We will be using the BBK system and will run three five minute qualifiers, two to count and thirty minutes for all finals. 9) Monthly prize giving will be after every race and also at the end of a six month period. Any person not present at prize giving will forfeit his/her trophy/trophies. 10) All drivers are compelled to check his transponder before the race starts. Failure to comply and then picks up trouble, the driver will have to bear the consequences. Race control will not accept responsibility, regardless whether it is a personal or club transponder. THESE RULES ARE FIXED FOR THE YEAR (2017) AND IS NOT OPEN FOR DISCUSSION. SHOULD THESE RULES NOT SUIT YOU OR DO NOT MEET YOUR REQUIREMENTS, THEN YOU ARE AT THE WRONG TRACK!!!! !